When filing an insurance claim in Ottawa, if you’ve ever said something ridiculous along the lines of, “I started to slow down, but the traffic was more stationary than I thought!”, then congratulations, because you’ve made it onto a list somewhere on the internet. Working in the insurance industry, your Ottawa home and car insurance experts regularly deal with fairly mild-mannered, honest Canadian insurance claims most of the time…but, occasionally, there is that oddball claim that stretches things out a bit too far. Really, working in the insurance industry leads to dealing with some pretty interesting and strange insurance claims, and that’s why Bradley’s Insurance home and auto specialists are going to take a quick look at some of these amusing claims. By working closely with our Stittsville community, Bradley’s Insurance has developed strong, longtime relationships by helping our local Ontario residents save money on house and car insurance. Whether you’re wondering if home insurance with a trampoline is going to be expensive or you’re just looking for the very best car insurance companies in Ottawa, Bradley’s Insurance can help you find the right coverage solutions. Learn more today by contacting us or getting a quote! If you were an insurance agent, then surely you would feel as uncomfortable as we would about insuring a long time cigarette smoker who also happens to be a pyrotechnic fireworks enthusiast. Several years ago, a State Auto Insurance Co. representative took on this type of client, and sure enough, on the Fourth of July one year, something went awry. Apparently, the client had placed several thousands of dollars worth of fireworks in his trunk and proceeded to drive toward an open field where he could, presumably, set them off. That sounds all fine and safe, right? Well, that is, until he decided to smoke a cigarette on-route, which was then tossed out his car window. Though the gentleman survived, let’s just say that his fireworks show went off prematurely. 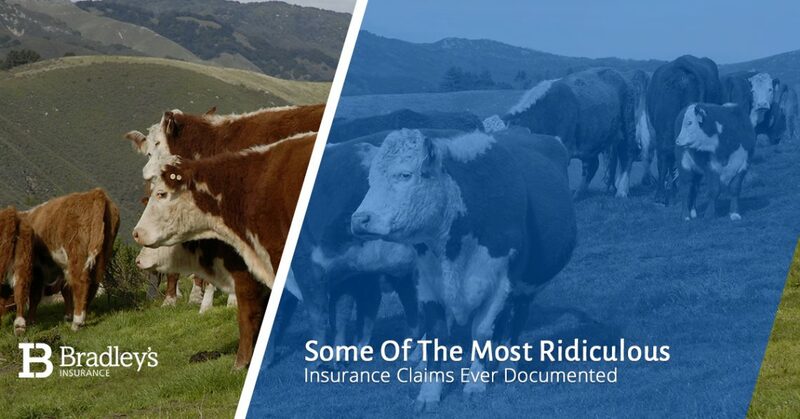 It’s not often that simple cows cause enough damage to warrant an insurance claim, but hey, things happen. As the situation goes, apparently a fisherman returning from a trip at sea was surprised to discover a mass of cows around his vehicle. The fisherman quickly noticed that the cows were licking and even biting at the exterior of the vehicle, presumably because so much salt from the ocean air was stuck to it. Imagining someone’s car turning into a bovine-approved popsicle is no doubt amusing, but the fisherman didn’t take too kindly to the situation. The bovine “attack” resulted in a considerable comprehensive claim. Simple but effective advice, hopefully, you’ll never legitimately need to tell someone not to put shampoo in their gas tank. Of course, that didn’t stop a woman referenced by Elephant, a British insurer, who apparently mistook her bottle of shampoo for a container of gasoline. How do you genuinely confuse the two containers for each other? Perhaps they looked similar, but how you actually manage to put shampoo – or anything other than gasoline into your gas tank – is beyond us. Sure enough, human beings are capable of incredible feats, and this isn’t the only documented case of putting shampoo into a gas tank. Can you imagine what other liquids (and maybe even solids?) have been mistakenly put into gas tanks? Back with even more practical life advice, our Ottawa home and auto insurance experts strongly recommend against driving around with a loaded shotgun in the front seat. During the first year of business, Ron Hettler of Hettler Insurance Agency had a client who did exactly what we just recommended against. After arriving at his destination, the client hopped out of this truck and grabbed the shotgun, only to lose his grip and have the weapon discharge. Fortunately, while the man was uninjured, the interior of the truck wasn’t so lucky. With the seat covers, headliner, dashboard, and windshield damaged, a comprehensive insurance claim was filed. Don’t get any wise ideas here, but the comprehensive policy did cover the damages. Despite some of these ridiculous insurance claims, the unexpected can and does happen. Make sure that you’re covered by Bradley’s Insurance home and auto specialists. Get a quote or contact us today to learn more.